BALTIMORE—Shuffle through a pile of press releases and the term “emerging brand” will make an appearance more than once. While the use of this term is becoming more commonplace, the meaning of “emerging brand” is up for debate—and that’s a discussion worth having. Held last week at Hotel RL Baltimore Inner Harbor, the 2017 annual Hotel Business Owners and Developers Roundtable, hosted by RLHC (Red Lion Hotels Corporation), welcomed panelists from across the hotel industry to discuss the impact of emerging brands. 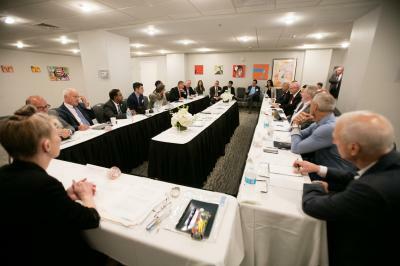 Arthur J. Gallagher & Co. Real Estate and Hospitality Services and Sobel Westex sponsored the roundtable, which consisted of 15 speakers in total. Right off the bat, Stefani C. O’Connor, executive news editor at Hotel Business, challenged panelists to define the term “emerging brand,” which prompted varying opinions from participants. Bill Linehan, EVP and CMO at RLHC, took the first stab at her question and restricted the term in question to new entrant brands. Other panelists discussed the importance of emerging brands customizing experiences for guests; there are additional opportunities to tailor to guests’ needs. “What’s cool about emerging, or any brand that’s reinventing itself, is this idea of getting closer to the customer and their specific needs, whatever that segment is,” said Paul Breslin, managing director at Horwath HTL. Compared to legacy brands, these emerging brands are doing their own research in advance. It’s that adaptation where emerging brands are finding themselves ahead, even from a developer’s standpoint. “For us, it’s the ability to change quickly and to fit into that demographic as they grow, and so it allows us to localize from market to market, allows us to change quickly on a dime, whereas the past brands, potentially at times, came so built into a box that it was tough, it was cost prohibitive and it also made the consumer go and try different things. And so the emerging brands, the smart ones, are allowing the adaptation and are allowing for that in the future,” said Kerry V. Ranson, chief development officer at HP Hotels. The roundtable also conversed about when a brand can be called a brand; why properties may or may not need to be associated with a brand to obtain financing; and how consistency can impede creativity. Other panelists included Roger Bloss, EVP and president of global development, RLHC; Isaac Brown, president and CEO of Extended Hospitality Group LLC; Elliott Estes, principal, Woodmont Lodging LLC; Bhavesh Patel, principal at ADM Hotels & Development; Ravi Patel, president at Hawkeye Hotels; Brad Rahinsky, president and CEO, Hotel Equities; Lou Schaab, CFO at Chesapeake Hospitality; Ben Seidel, president, Real Hospitality Group; Larry Spelts, president and chief development officer, Expotel Hospitality; and Steve Van, president and CEO at Prism Hotels & Resorts.